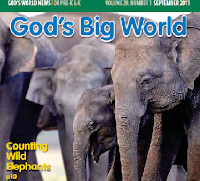 We had the amazing opportunity to review a new middle school writing program from the publishers of God's World News and World Magazine. You may already be familiar with these great magazines such as the one below. This could not have come at a more appropriate time for my 8th grader. We reviewed a pilot of this new Christian writing curriculum and I have to tell you that my son loves it and has loved it since he began. In the first lesson (you can see a sample here), students focus on advertisements and pictures to begin the first steps to writing which is processing the information that you want to put down on your paper. The teacher guide has questions that you can ask your student if they are having a difficult time processing this on their own. This approach has students writing without even knowing that's what they are doing! We could not be more pleased with this writing curriculum and plan to continue to use it for the rest of the year. As you will notice in the sample above, your student will need a journal that is not included with the curriculum. The lessons are broken down into 5 capsules per lesson so it is very easy to complete 1 lesson per week at the beginning. As the lessons continue, more time will be required to complete the lessons. Simple grammar lessons are also integrated in the writing curriculum. The curriculum is designed as a two year curriculum and we reviewed the first year book. You can see what will be covered in the Year 2 book here. I love the purpose and method that this curriculum uses to teach students. It teaches that writing does not have to be dreaded and hated but that it can actually be fun. Yes, fun! More importantly, it teaches our students how to give a written voice to what they believe. Writing skills are commonly deficient among students entering college, but the problem and its fallout begin years earlier. Poor writing skills hurt a student's performance on exams and in courses requiring composition. For Christian students, poor communication hinders the believer's voice from influencing their social circle and, ultimately, the broader public square. Write with WORLD aims to produce young writers who love writing, can write effectively, and intelligently share ideas, beliefs, and their worldview. We hope to support a generation of young believers who aspire to use their writing skills in the service of God's Kingdom and explain effectively the reasons for their beliefs. The first year book can be purchased here (scroll to the bottom) for $95 which includes both the student and teacher books. You can also purchase years 1&2 together for only $165. Be sure to read this article that was published in World Magazine about the new Write with WORLD curriculum too. Don't forget to check out what my fellow crewmates thought about Write with WORLD. **Disclaimer: I received a free student and teacher book in exchange for my review. The opinions here are my honest and true evaluation.